Students gather outside the Bayard Rustin Educational Complex on their first day of school. CHELSEA — A plan to turn a residential Chelsea block into a “play street” for middle schoolers to take P.E. classes would exacerbate problems on a stretch where students regularly get into fights, throw trash on the ground and "frighten" neighbors, locals say. The Bayard Rustin Educational Complex wants to close West 18th Street, between Eighth and Ninth avenues, off to traffic during school hours and use the stretch for supervised physical education classes and possibly recess, the city Department of Education’s head of campus operations, Nick Fiore, told Community Board 4’s Transportation Planning Committee on Wednesday. But neighbors at the meeting said they feared emergency vehicles wouldn’t be able to access the street — which is home to the LGBT Callen-Lorde Community Health Center — and worried that the plan would do nothing to mitigate ongoing problems on the block, where fights between students are a common occurrence, several residents said. Crowds of students block the street in the afternoon, pay no heed to pedestrians trying to pass and throw trash onto the street, a resident of West 18th Street said. “These are not children — these are young adults. They are taller than I am. I’m frightened by them,” he said. “They’re bratty young adults, not kids,” another resident added. “And if this goes through, there needs to be security guards out there." Larissa Gonzalez, a resident of West 19th Street, said students have thrown everything from cue balls and food refuse to “sexual and really other gross” items through the school windows and onto her roof. Several rarely used playgrounds and open spaces near the school could be used for P.E. classes instead, residents said. Moreover, middle school students “do not need a play street,” said Frank Lowe, vice president of the 300 West 18th/19th Street Block Association. While Fiore said he couldn’t dispute the neighbors’ anecdotes — having “seen them [himself]” — he argued that having a play street would provide the school a reason to have teachers, aides and safety agents out on the street. 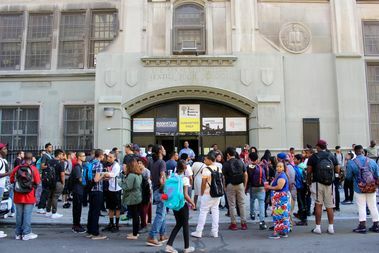 The seven-school building at 351 W. 18th St. houses around 2,200 students — up from around 1,600 or 1,700 students four years ago — and a mandatory recess for middle-schoolers often “monopolizes” its two gymnasiums, Fiore said. Under the play street proposal, the street would be car-free between 8 a.m. and 4 p.m. Monday through Friday, from September to the end of June, he explained. A security guard would likely be posted at the end of the play street to allow access to emergency vehicles, he noted. Following the public discussion, committee members asked Fiore to withdraw his application for the time being to explore possible alternatives to the play street, address neighbors’ concerns and nail down a plan to deal with emergency vehicles.